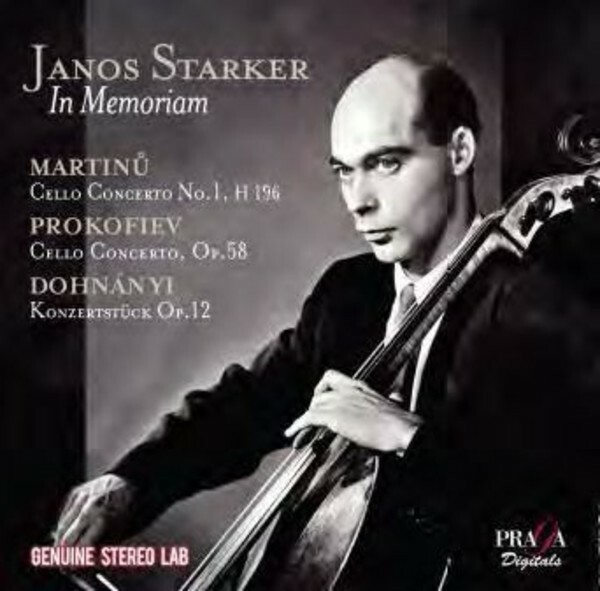 Only Janos Starker could propose such a programme: as difficult for the instrument as poorly rewarding for the instrumentalist, the artist must fully express the lyricism from these almost forgotten cello masterworks of the 20th century. At that time, he played the 'Lord Aylesford' Strad, then a Matteo Gofriller (Venezia, 1659-1742) for Martinu�s score. A true image of a master, brought to America by Antal Dorati [then at Dallas] and poached by Fritz Reiner for the Met orchestra, Starker following him to Chicago in 1953. Having left Chicago in 1958, he took up the professorship at Indiana University that made him the most celebrated cello teacher in America, and resumed his solo career, giving hundreds of concerts on every continent. From the 1960s Starker was one of the world's top soloists, famed for his concert demeanour. His bow arm was the envy of colleagues, his legato immaculate, and his left hand delivered pinpoint intonation. In all this he was the heir of Emmanuel Feuermann, whom he had heard play with Bartok, at the tender age of 9. He continued to teach until his death in 2013.